Show 3 at the new Loading Bay Gallery in Station Drive opens on April 1. Among the large line up of artists for the April show are Jeannie Kinsler, Vulindlela Nyoni, Fran Saunders, Melody French, Pascale Chandler, Grace Kotze, Lesley Ireland Mathew, Deidre Maree, Louise Jennings, Nikhil Tricam, Ashley Viljoen, Celeste Bredin, Cameron de Bruyn, Jane Oliver, Lara Mellon, Shauna Southam, Sharon Erichsen, Roz Cryer and Mike Maxwell. “The group includes a very diverse mix of materials from wood, pen and ink, oil paint, mixed medium, acrylic paint, works on paper, and ceramics. 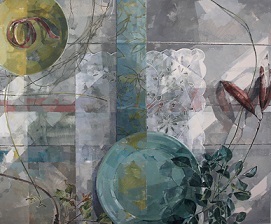 Likewise, the subject varies greatly from the seductive material of paint holding the content to the naturalistic depiction of an object carrying the main value of the work,” says Grace Kotze who runs the gallery. The exhibition runs until May 1 at the Loading Bay Gallery at 15 Station Drive, Durban (housed in Con Amore Home). For more information contact 082 560 5045.